This is a chocolate lovers cake! It has shaved chocolate in the chocolate mix. I baked it for 45 minutes, then cooled. I used chocolate buttercream icing. 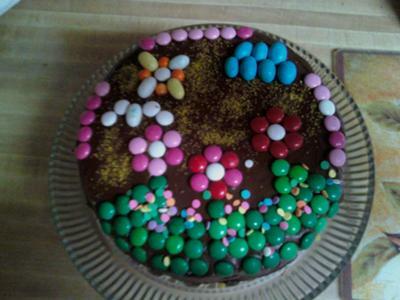 It is decorated with m&m's, for the sun, cloud, bird, flowers, and grass. Very cute!!!!!!! And sounds yummy too!!!! !